Thread: Flying cars in 2019? #1 Flying cars in 2019? A company called Lilium has been creating an almost passenger car sized flying VTOL jet and tested their latest prototype this year. They claim this technology will be out in public as flying taxis in cities in 2019, and in 2025 you're supposed to be able to buy it yourself. 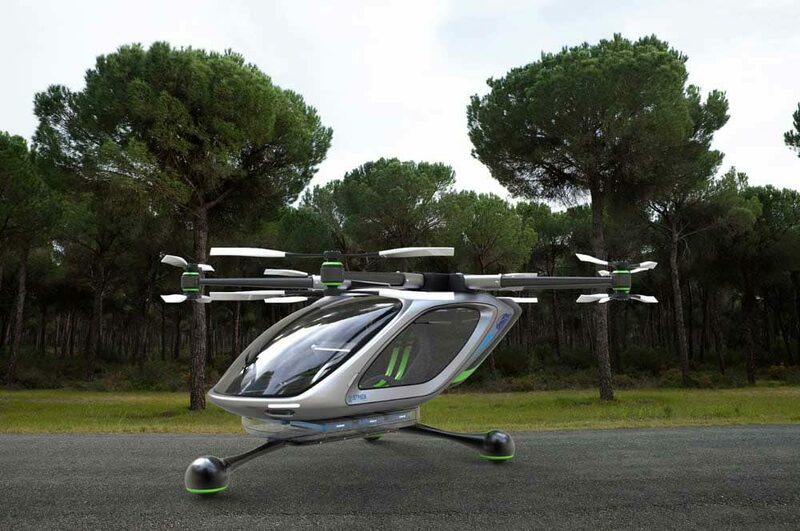 It's completely electric, has 5 seats, flies up to 200km/h and can fly about 200km/charge. It also should have an autopilot and the capability of flying by itself - you can order it to pick you up with your cell phone. What do you think? Will there be flying cars in traffic in 2 years? I'd like to be optimistic, but this just seems a bit hard to accomplish. What do you think? Will there be flying cars in traffic in 2 years? There will never be "flying cars." There will be better cars and better airplanes. Flying cars have been "promised" since 19401: we still haven't got one. 1956/58 - Ford Volante Tri-Athodyne. 1956 - US Armys Transportation Research Command "Flying Jeep". 1957 - Chrysler, Curtiss-Wright & Piasecki built prototypes. Piasecki developed theirs to be a civilian model. Late 1960s - Moller Skycar. Mid '80s - Boeing Sky Commuter. 2006 - Urban Aeronautics X-Hawk. 1 Henry Ford: "Mark my word: a combination airplane and motorcar is coming. You may smile, but it will come”. Dont' think we'll see them until we have truly cheap environmentally low-impact and high-density energy storage many orders of magnitude better than current technology. Given current or near-term technology I'd flatly object to any thoughts of flying cars as hugely environmentally irresponsible. An issue with flying cars is that they will always require more energy per km/mile traveled than a land vehicle carrying the same load. This will make them more expensive to operate. The extra safety features that will need to be engineered into them to prevent failure in flight will also increase their over-all cost. I just don't see them as ever becoming common. If anything, they'd be a novelty for the very rich. I think we may eventually see a 'viable' flying car as an evolution of drone technology, (perhaps something using multiple rotors) (https://www.youtube.com/watch?v=vJZzEtfMfw0), but I imagine there will also be issues over 'air lanes' (quite just where exactly people will or won't be allowed to fly them). Perhaps keep your eye on places such as Dubai, they have recently taken a strong interest in the Martin jetpack, (Martin Jetpack), to help their firefighters tackle tall building fires, so the concept of an actual flying 'car' would probably be of great interest to them. In general Dubai certainly, has the money to buy them and an almost manic desire for even the most insane creations the automotive world has to offer. Last edited by Ascended; September 23rd, 2017 at 05:10 PM. Flying cars have been "promised" since 19401: we still haven't got one.1956/58 - Ford Volante Tri-Athodyne.1956 - US Armys Transportation Research Command "Flying Jeep".1957 - Hiller.1957 - Chrysler, Curtiss-Wright & Piasecki built prototypes. Piasecki developed theirs to be a civilian model.Late 1960s - Moller Skycar.Mid '80s - Boeing Sky Commuter.2006 - Urban Aeronautics X-Hawk.2013 - Terrafugia TF-X.Etc. Etc.1 Henry Ford: "Mark my word: a combination airplane and motorcar is coming. You may smile, but it will come”. Did they actually manage to make a flying car? I mean, Lilian did do it and their prototype looks pretty manageable to get to the public. I think the cost is not so big of a problem: When the idea and prototype is first out, yes only rich people will probably buy them, but the competition would have started and the new technology would be getting better with an exponential rate. I think the laws of flying will be what is controversial. Of course if companies really manage to make their vehicles fully autopiloted those laws will be easier to make since there's no human error (different from autopilots in cars since there already is laws for cars: With flying vehicles you will start from scratch, which makes it easier). After that your every action should be to accomplish that. Did they actually manage to make a flying car? I mean, Lilian did do it and their prototype looks pretty manageable to get to the public. I think the cost is not so big of a problem: When the idea and prototype is first out, yes only rich people will probably buy them, but the competition would have started and the new technology would be getting better with an exponential rate. I think the laws of flying will be what is controversial. Of course if companies really manage to make their vehicles fully autopiloted those laws will be easier to make since there's no human error (different from autopilots in cars since there already is laws for cars: With flying vehicles you will start from scratch, which makes it easier). It's not just the cost, it also the fact that flying is simply less efficient in terms of energy usage than remaining on the ground. Unless you also extrapolate a plentiful, cheap, and clean source of energy, it will be a wasteful extravagance only used by a few.